Stratford-upon-Avon is a three platformed station, painted in GWR chocolate and brown. Flowers on the station make it look attractive. As we leave the station we pass plies of track on the right. We pass some factories on the left and new housing on the right. We are going slightly uphill on welded track, as we pass under the A46. We go past some sheep grazing in fields on the left then it starts to get hilly as we go into a cutting. We then slow for Wilmcote station, where you alight for Mary Arden's house. There are two nice redbrick station buildings on the platforms as well as a "cycle station"! We pull away past flat fields on the right, only reaching 20 mph. Then we stop to get a token before going onto the single line branch. A three-car Class 150 Metro train is waiting, as we cross tracks and go onto the line to Leamington. Tractors are working in the fields on the right and then we speed up, passing through Bearley station, which has a single platform and glass shelter. It's very countrified here, with few houses. We then go into a cutting, doing about 50 mph. I notice that it's now electronic signalling. We emerge to see wheat fields on the right followed by yellow fields full of rapeseed. On the left I can see Jersey cows grazing and the occasional farm cottage in the distance. This is followed by the strange sight of a completely white coloured herd of cattle on the left! The driver blows his horn as we slow down, coming to a stop at Claverdon Station. It has one platform, with a blue and green framed perspex shelter. There is an old platform opposite all overgrown and neglected. It's in a small village with a modern "station works" light industrial unit nearby. We go straight out into the countryside and onto an embankment. There are sheep in the fields on both sides as we pass under the M40 and the track becomes double again. A single track goes off to the left to join the Chiltern mainline and we go right, joining it a short distance later. 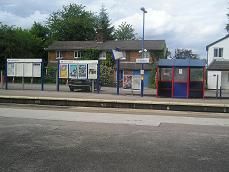 We come into Hatton station, which has three platforms, two of them on an island. It was once a busy junction station, but now has two red and blue-framed shelters and just a few trains that stop here each day. We now change tracks and go south down the Chiltern mainline, passing through Warwick and stopping at Leamington Spa where I get off. The train will continue all the way to London Marylebone.